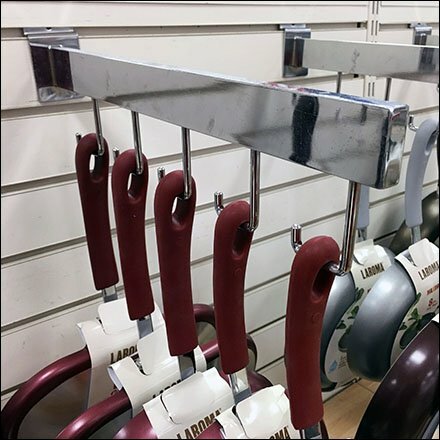 Widely spaced and all organized, this J-Hook Slatwall Faceouts For Cookware display impresses by sheer extent of offerings. And J-Hooks insure easy facing of each lane, as well as easy removal for product inspection. Declined J-Hook Waterfall Faceouts would have required more vertical space. So in this instance, a non-declined Faceout might be best. This J-Hook Slatwall Faceouts For Cookware display seen at Marshalls.